oh, i’m not in jersey this morning but thanks for the great diagrams. I think I’m in North Jersey. Today, it’s Beginnings and Endings in the morning and then Collage in the afternoon. There may be more diagrams yet to come. North Carolina also thanks you. Okay, okay, America, here are your diagrams. No, no, wait, I’m leaving out Oz. And Germany. And . . . Here are your diagrams, Argh People. They’re pretty boring, but they’re yours. In Joisey wishing I was there at conference. Thanks for these! Not boring at all. In fact, those of us residing in La La Land are having what you might refer to as a EUREKA moment over that second one. Ooooh, the Eureka moment. Have a cigarette on me. Just finished the Beginnings and Endings class. Forty-five minutes. We move like the wind here in NJ. These diagrams are great, thanks! Wish I could have been there for your workshop. Fabulous, thank you, whereever you are. Love this, thanks from Colorado! ACK! It’s very simple, yet extremely helpful! Whew! I wish I’d been there, though I did something similar when I flew out to NJ to stay with a friend not too long ago. Good grief, by the time we were done, both our brains were dead. I feel very out of the loop. Why are you in Jersey? And are you teaching more? Md/DC/VA maybe? Bob was supposed to teach here but he had family stuff. He knew I was free since I’m not going anywhere, so he called in a favor. Plus he knows my grandbaby is here so I’m an easy touch for NJ. Plus the NJRWA does a great conference and has been doing a great conference for 25 years (Go, NJ!). The next conference I’ll be speaking at is probably National in Nashville if they accept the panel proposal I’m part of. See, I have these BOOKS to write. I’ve always wanted to go to the NJ conference. Thanks for this. I’ve just finished Lani’s six week course on revision and it was marvelous, so now I can puff out my chest and say “I know this,” however, if I can apply it is another topic altogether. But you know, I can see your tent pole is “This is what I really want” so I’m going back to look at my notes. Are you still in NJ? Because somewhere in NJ there’s a comic store celebrating Wonder Woman Day. “Celebrated by two comic stores (one in Portland, OR and one in Flemington, NJ), Wonder Woman Day is a charity event offers signings and auctions benefiting domestic violence charities. Click through to see some of the art up for auction. Ugh. I’m never going to get this. The tent pole is in the middle of act two and props up that act preventing the dreadful sagging middle, it just isn’t shown in this diagram. Didn’t get it when Bob explained it, thought I did when Lani explained, but obviously still have some processing, or maybe that’s putting it into practice, to make it automatic. Not sure what you mean by tent pole. The mid turning point/point of no return? That’s the midpoint of the book, between acts one/two and acts three/four. It’s the one labeled Point of No Return/This is what I really want. Does that help? I teach structure with seven “anchor” scenes. So, instead of knowing beginning and end and having to fill in between, you know one anchor (opening scene) and have to take that to the next anchor (1st TP/Acceptance of the Call to Adventure) and basically hop from lilypad to lilypad until you’ve got your story figured out. The “tent pole” is my view of the midpoint, which I think is where we see things different. The midpoint/tentpole/Reversal of Fortune comes in the middle of the second act, between the first TP (Acceptance of the Call) and the 2nd TP (Point of No Return) in which there is a reversal of fortune (good or bad) that essentially changes the landscape of the problem, escalates the conflict, and helps push your protagonist along to the 2nd TP/Point of No Return. I usually see the Midpoint as a companion scene to the 2nd TP; it’s what happens here that sets up that Point of No Return, if that makes sense. I did steal it from screenwriting because I think having a view of that scene as a tent pole in the second act helps deal with the Sagging Act Two Blues. So later on tonight we will be getting our ducks in a row and renaming TPs. Over wine. Argh. Will you post for those of us following you? Thanks! I was in NJ at the workshop and it was fabulous! And the Collage one was awesome too! Wow! I remember hearing this at CherryCon. I was so wiped out, I didn’t remember if there were pictures. (Probably there were…) Anyway, it’s great timing for me to see them again. Thanks from Illinois! Hope you got home safely and the dogs didn’t tackle you on sight when you got back. Thanks so much for the charts. I missed your Friday workshop, but the Beginning and Endings class was incredible. Thanks for the great info! i went flying about for a wedding a couple of weeks ago, and a guy on the tram from the rental car place to the airport made off with my bag. it’s a black roller bag, just like every other one out there. i caught him just this side of security, and all i could think of was the pink pig and your stars. i’m totally stealing your silver decorations idea ’cause i nearly had heart failure when i realized that my bag was gone. I went back to check on the audio from Lani’s class. She used the four act structure like you do. I guess where my confusion came in was the use of the term midpoint. 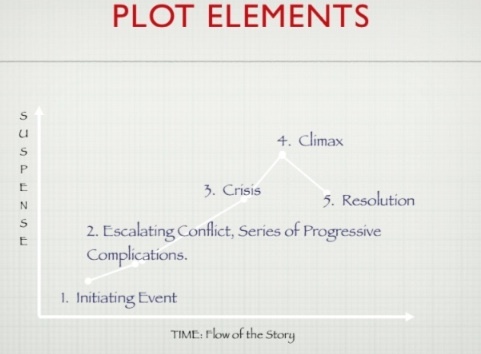 Lani has a midpoint in Act 2, an anchor scene, that comes before the midpoint or 2nd major TP, which in this diagram of yours is the story midpoint. She calls it a tent pole and it props up Act 2 and prevents that sagging middle. I think I’ve got it now. Huh. Lani has a TP in the middle of Act Two? 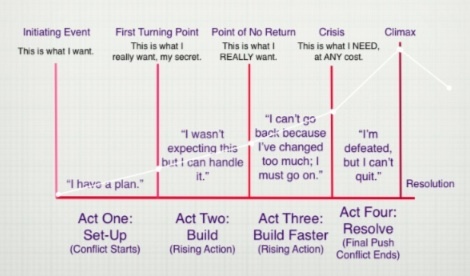 I know screenwriting structure has a TP in the middle of Act Two because it only has three acts. I’ll get Lani in here to answer this one. I was pretty sure she used the same structure I did. Oh, hey – I buried my answer in a reply to Robena a little upriver here. Hope that clears things up! So if Lani and I can find the time, I’m going to sit down with her and work this out so we can figure out how we can teach this without confusing people. I think the easiest way will be to change my terminology, but this is an easy fix. Stay tuned for a post on it. You guys are great. Such good teachers. I’d love to see the post. I do like the midpoint in Act 2 as it does prevent the collapse of the souffle. I found I’d written it intuitively but when Lani taught the concept, I went back to the ms. and heightened the conflict/tension and it is so much better now. Thanks for joining us for an awesome time in NJ! My laptop kept me from getting writer’s blister during that first three hour tour, the three hour tour (sorry, repetition is obligatory with that phrase), but my fingers were definitely cramping from all the great info. And these charts are great – we here in Jersey just do better with pictures. Great to see you face to face, Jenny! And Happy Birthday to the little one, Lani. NJ was my first conference back in ’07 and I hope to make it back eventually. They really do run a tight ship up there. Hope to someday catch one of these workshops with you, but until then, I’m grateful for all the stuff you post here. I spent the weekend plotting out my NaNo book using your Turning Points diagram. Came in very handy. The late, great Blake Snyder (RIP, Blake) in his new book coming out soon, talks a lot about the midpoint and its connection to the point of no return. Whatever happens at the midpoint (it’s either going to be a false victory or false defeat), the opposite has to happen at what he calls the All Is Lost moment, which comes right before his turning point into the last act, which he calls Break Into Three. So if it’s an “up” at the midpoint, it’s a “down” at the All Is Lost moment, and vice-versa. He references this on page 104 in Save the Cat. Also, you can read about it much more in depth by going to his website and downloading (for free) Chapter 3 of his new book, to be published posthumously in November, called Save the Cat Strikes Back. He has a visual diagram on page 47 of that excerpt that I love–it ties into this whole discussion about midpoints. I highly recommend it. Also, check out pages 82-84 in the original Save the Cat for a great discussion on midpoints–including the artificial high or low associated with them. Had nowhere else to post & I figured yáll had to see this. So Lani and I finally sat down after a hectic day and compared notes on our structure theories and they’re not the same at all. We’re going to talk about it more tomorrow and then do dueling blog posts so you can compare our methods. Basically any structure that works is good, and there are a lot of them, so this way you’ll get to see two different approaches. Look for posts probably day after tomorrow. Yep. Lani has youth and speed on her side, but I have guile and treachery. Also no shame. Thank you New Jersey! And Jenny! Can’t get this link to work on Safari. Is it just me? It usually is. I can’t get to it either, and neither could my mom. So, I doubt it’s a Safari problem. The rest of the Nano site seems to be OK.
Um, I don’t think there’s any need to go Franchise about this, and try and standardize the basic plot for worldwide distribution. Many roads to Oz, right? Some people will feel more comfy with one writing methodology, others with a different one, and some lucky people might even come up with something very original (-:. That said, if you and Lani work out your differences on-line, I’m sure it’s bound to be very enlightening. Even if you agree to be different . . . . Thank you, Ann. And thanks for the next post (g). Several solos coming up, thank you very much. And now I miss collaborating.